Ever wondered where the world’s richest people live? While London and New York are ol’ standbys, as you may have guessed, it looks like the wealthiest of the wealthy are popping up in completely new locales. CityLab recently took a look at Knight Frank’s Wealth Report 2015, which identifies the world’s “ultra-high-net-worth individuals” (UHNWI), a set of the global population that accounts for those with more than $30 million or more in net assets, and found that there are roughly 173,000 people in the world who fall in this category. To put that number in perspective, these folks make up the upper 0.002 percent of the world’s 7 billion inhabitants and hold over $20 trillion of its money. 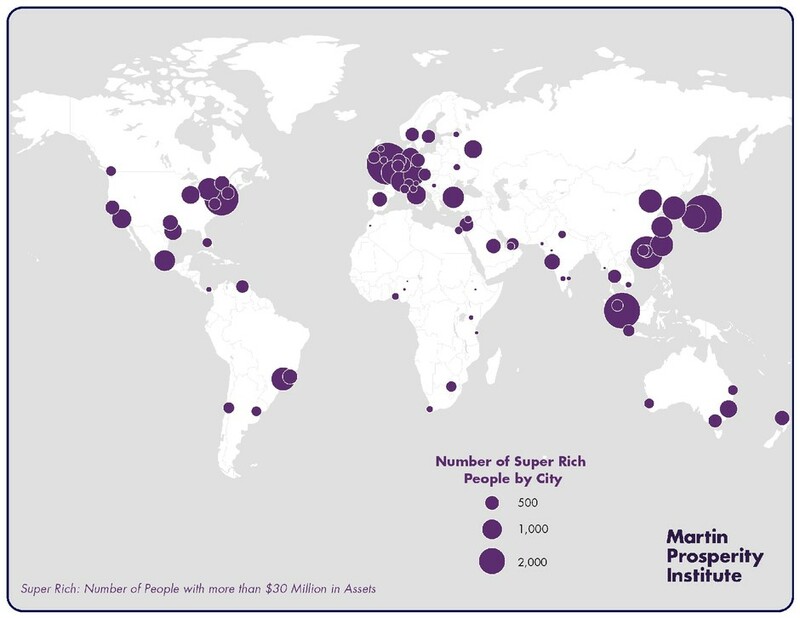 The map above was created by Martin Prosperity Institute and charts the world’s superrich. 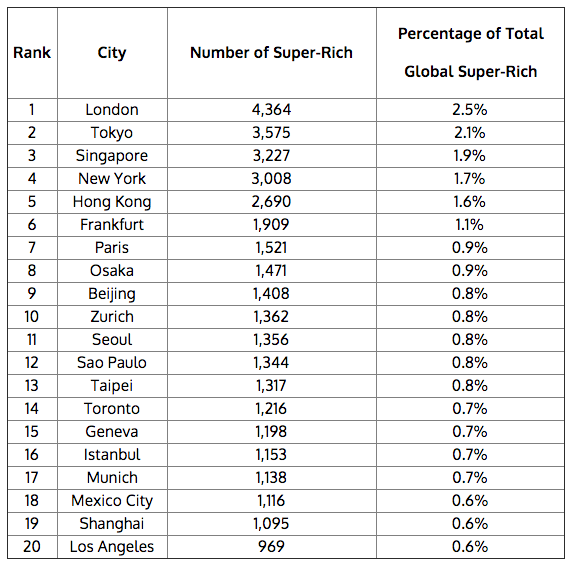 It also comes accompanied by the graph below which ranks the world’s top 20 cities by the number of UHNWI they have. London topped their list while New York came in fourth behind Tokyo and Singapore. Another highlight worth noting is that they found Asian countries rose significantly in the ranks to account for the second-largest growth in UHNWI. Euro newbies Frankfurt and Paris also made the list for the first time this year. 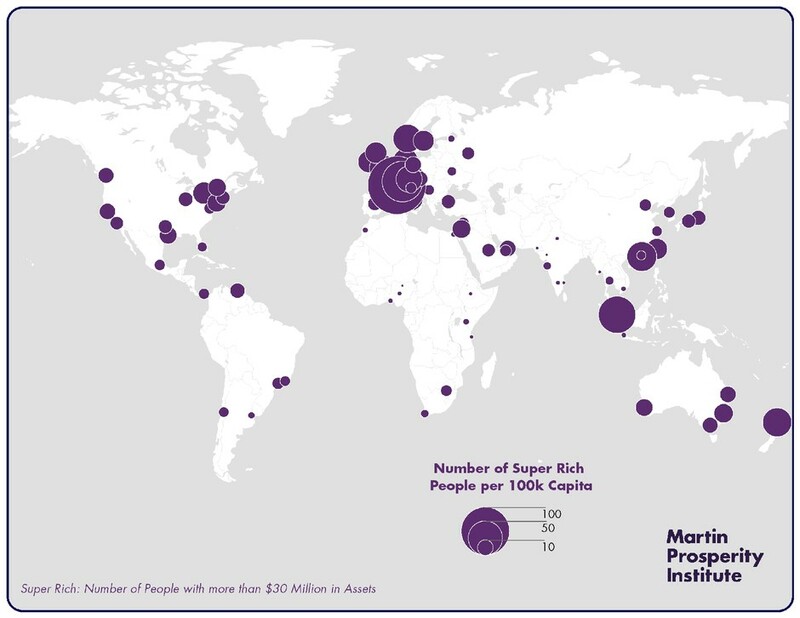 Looking at the numbers on a per capita basis, the picture shifts a bit. 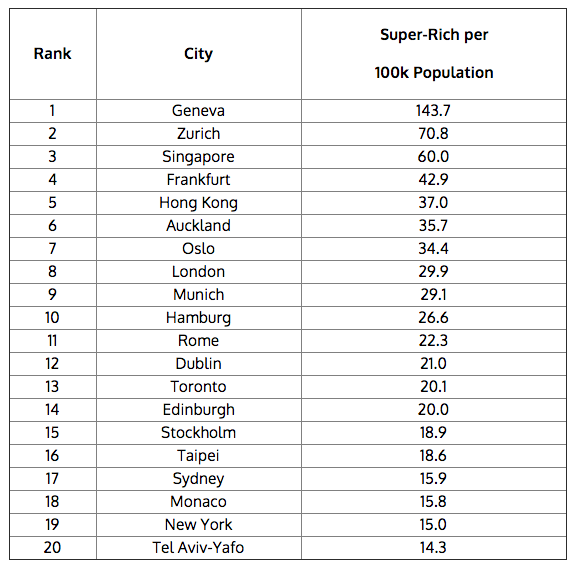 The Martin Prosperity Institute found that Geneva had 144 superrich individuals per 100,000 residents, giving them top rank, while New York dropped to 19th place. 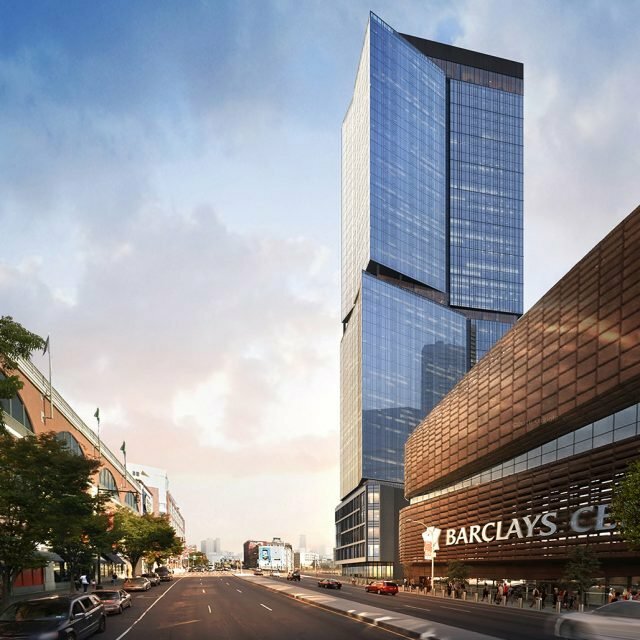 But don’t discount New York in the race to be the richest, the report also provided some predictions; namely that by 2024, our city will be home to over 520,000 individuals worth more than $1 million. You can find out more over at CityLab.